The Spartans, who are seeking their first state title, will play Pasco. 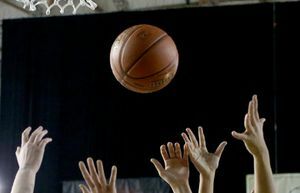 Metro League foes Roosevelt and Garfield will play for the Class 3A title. 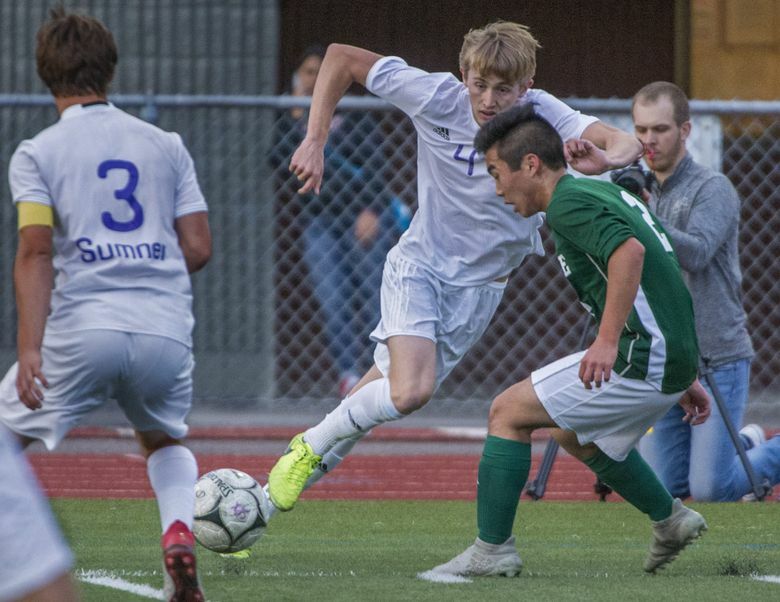 PUYALLUP — The effort put forth by the Skyline High School boys soccer team was a great example of never giving up hope. With Sumner dominating and pressing from end line to end line, the Spartans of Sammamish remained resilient. They fought off chance after chance and seized a rare chance of their own. Senior captain Sergio Palomino poked in a goal at the right post on a corner kick from Joseph Camp as Skyline emerged with an unlikely 1-0 double-overtime win with a golden goal in the 87th minute in a Class 4A state semifinal on Friday night at Sparks Stadium. “There was a big scramble in the box and I stepped in front and dropped back to see where the ball was going in and just kind of stuck my foot out,” said Palomino, who practically hid behind the far right post before knocking in the point-blank goal for his fifth score of the season. “I just prayed for it to go in and it did. Sumner’s a great team and they gave us a great fight, but the Skyline Spartans fought hard and we found a way to win. Sumner outshot the Spartans 14-10, but had the edge in possession. 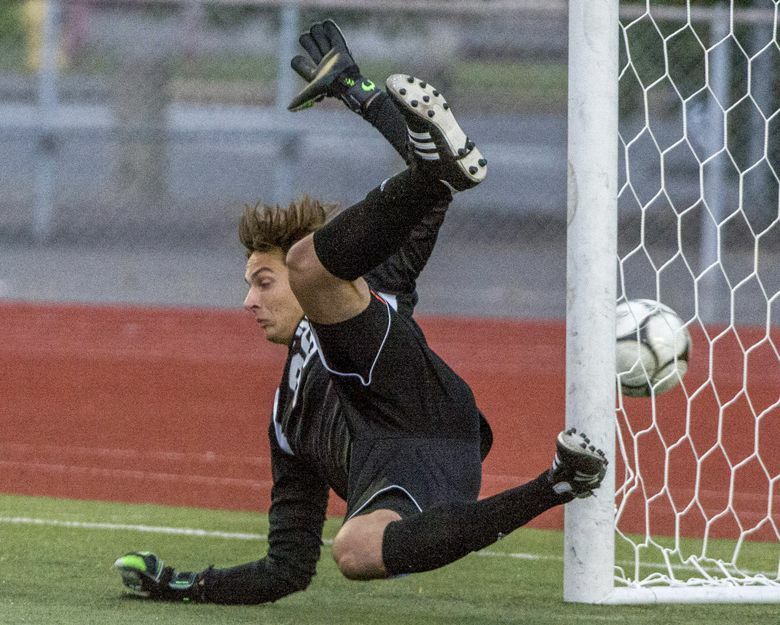 At the start of the first OT, it appeared Sumner (18-3) was finally going to cash in, but Skyline goalkeeper Lucas Richardson came up with a pair of stops on attempts by Kurtis Vanhout in the 81st minute. Skyline (17-1-3) faces Pasco (20-2) in the state final on Saturday at 5 p.m. after winning a tense battle of two teams with the Spartans as their mascots. 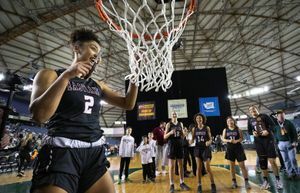 Skyline, the runner-up in the regular season in KingCo 4A to Issaquah, reached the state semifinals for only the second time and are shooting for its first state championship in school history. The Spartans had a runner-up finish in 2011. That season, the Spartans fell to KingCo 4A rival Eastlake 2-0 in the Class 4A final. 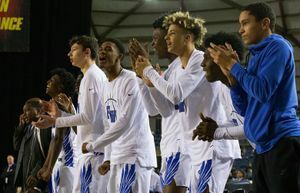 Sumner advanced to the state semis for the first time in school history and will post the program’s first trophy (top-four) finish in eight state trips. • Senior forward Oscar Cortez put up a goal and an assist as Pasco advanced to the state-title match for the sixth time in school history by beating Eastmont 2-1 in the other Class 4A semifinal. • Junior Avery Jacobson supplied two goals and an assist as the top-ranked Roosevelt Roughriders (21-1) moved within one victory of a state-title repeat by beating Redmond 6-0 in a Class 3A semifinal. Roosevelt, No. 23 nationally, erupted for three goals in the opening 49 minutes and gets a rematch with Garfield, the lone team to beat the Riders in 2018, in the title match. Jimmy Reid Torres added a pair of goals. Senior midfielder Oscar Harding led the way with three assists as Garfield (16-1-4) dispatched of its Metro League rival Lakeside 3-0.